Engineering forum in Technopolis "Moscow"
We are pleased to welcome You to the official website of the Scientific Industrial Corporation "Delta-Test" - a leading Russian developer and manufacturer of precision equipment for electrical discharge machining of materials. Here You can find basic information about our company, products, services. In the case of any additional questions, technical and financial nature, please contact us in any convenient way (see Contact Us). 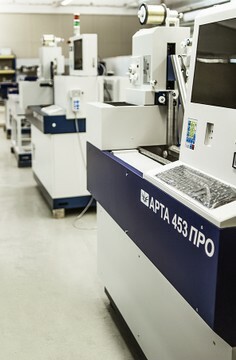 Today SIC "Delta-Test" is a widely known Russian manufacturer serial high-precision EDM machines with numerical control (now the issue is about 60 machines per year, not counting the works on retrofitting of equipment and other additional services). Most of our products are manufactured under the registered trademark ARTA. Brief information about the history of the development and current level of SIC "Delta-Test" in the section About.